Successfully Added Christmas Tree USB Flash Drive - 8GB Holiday Ornament to your Shopping Cart. Christmas tree style USB flash drive that can also be used as a holiday ornament or wearable pendant. Want to give your relatives some digital pictures as a gift this holiday, but do not want to be passing out cold looking USB thumb drives? Then have we got something for you! 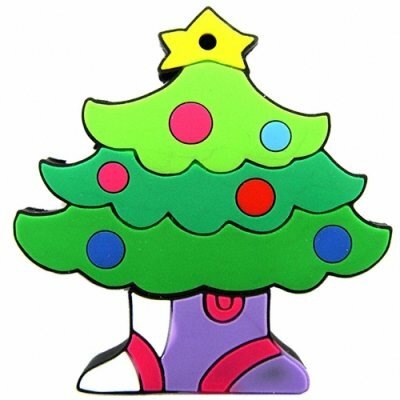 A USB flash drive styled as a colorful Christmas tree. What better way to surprise your guests than to ask them to take this ornament off the tree and plug it into the computer? Soon everyone can join around the computer, looking at your years worth of photos and rejoicing in the memories. This holiday tree style USB thumb drive also makes a great decorative necklace or can be hung comfortably on your keychain. This great personal USB flash drive can be ordered at a low wholesale price for resale on your internet or physical store. This is one unique Christmas ornament your customers will love - brought to you by the online leader in direct from China wholesale electronics - Chinavasion. Wear it with your holiday clothing for extra fun!